Death of a Legend: Carlos Fuente Sr.
Carlos Fuente Sr. died on Friday night in Tampa, Florida, after a battle with stomach cancer. He was 81 years old. Carlos Fuente Sr., the patriarch and longtime chairman of Tabacalera A. Fuente y Cia., died on Friday night in Tampa, Florida, after a battle with stomach cancer. He was 81 years old, and was surrounded by his family at the time of his death. Fuente ran one of the world's largest handmade cigar companies, presiding over such storied brands as Arturo Fuente and Fuente Fuente OpusX, and making many brands for others, among them all Ashtons and Diamond Crowns. He worked alongside his son, Carlos Fuente Jr., who is president of the company, and his daughter, Cynthia Fuente-Suarez. Both are actively involved in the company today, continuing the family tradition of making fine cigars. 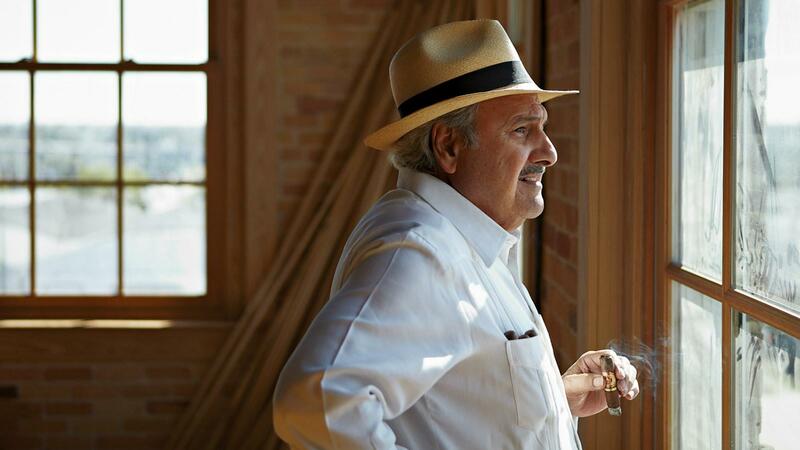 From a humble beginning in Ybor City, Florida, making cigars from his parent's home, Fuente Sr. built Fuente into an international powerhouse, with its cigars known and revered the world over. His company today makes more than 30 million cigars a year in Santiago, Dominican Republic, all of them by hand. "I never cared about being the largest cigar manufacturer," he once told Cigar Aficionado. "I always cared to be the best." Fuente's cigars scored numerous high ratings in Cigar Aficionado magazine, including being named Cigar of the Year in 2005. He was inducted into the inaugural class of the Cigar Aficionado Hall of Fame in 1997, and was the last surviving member of that group. "Senior was a giant—part of a breed of pioneers that helped make the handmade cigar industry what it has become," said Marvin R. Shanken, editor and publisher of Cigar Aficionado magazine. "A family man, a humble man, his memory will remain forever." "It's the end of an era," said Robert Levin, owner of Ashton Distributors Inc., who knew Fuente Sr. for decades. "He was a unique guy, an amazing person. He was a problem solver, and would look at a situation and come up with a solution no one else would think about." "He was a great man, the greatest man I have ever known," said Wayne Suarez, his former son in law and a former Fuente executive. "There will never be another Carlos Fuente Sr."
Fuente Sr. was known as one of the hardest working men in the cigar industry. "I've been working since I was eight years old. From selling fruits in the street, shining shoes, I've done about anything you can think of," he said to Cigar Aficionado in 2012. "When I was 14, 15 years old I used to have two jobs. I used to go to school, I used to get up to deliver papers, and after school I used to be at work until 11 at night in the drugstore. I've always loved to work." Fuente Sr. was also a fighter who overcame obstacles. He contracted polio at the age of 11, and some said he would never walk again. It took several years, but Fuente Sr. regained the ability to walk normally. Carlos Fuente Sr. with son Carlos Fuente Jr. The Arturo Fuente brand was created by Fuente's father, Arturo Fuente, who began making cigars in West Tampa, Florida, in 1912. By the 1920s the business had grown big enough to incorporate and had 500 employees, but in 1924 the cigar factory burned to the ground. Arturo, who was underinsured, had to stop production. In 1946, Arturo set out once again to make cigars, this time on the 10-foot-by-16-foot back porch of his home in Ybor City, a part of Tampa. Fuente Sr. was 11 years old at the time, and he grew up working in the business and helping out his father, first sweeping floors then learning how to roll. He had to make 50 cigars each every day when he returned home from school. Fuente was a local business in the 1950s. Every cigar that the tiny factory made was sold in the Tampa area, and strictly for cash. The cigar business wasn't strong enough to support Fuente Sr. with a salary in those early days, so he took a job as a baker. When he left the bakery to work full time at Fuente, he was paid a mere $40 a week. In 1958 Fuente Sr. bought the company from his father for $1. It had assets of $1,161 with zero debt and was making only a few thousand cigars a year. Fuente Sr. set his mind on expansion, which meant selling cigars on credit. He began by expanding to other parts of Florida, then New York City, focusing on markets with a strong Latin community. As sales grew, he added employees, but times were still lean. He was living in his parents' house, which still served as the factory. As it grew, cigarmaking would expand into more rooms in the house, forcing the Fuentes to move their furniture to the street each day to create temporary workspace. Times remained tough in the cigar business. Fuente opened his factory in the Dominican Republic in 1980 with his son, Carlos Fuente Jr. They worked 18-hour days, reinvesting any profits into tobacco, building a massive inventory of fine leaf. "When I first started in Dominican, all our profit, we stuck it back. All our profit was always invested in tobacco. And aged tobacco is the most important thing that you can have. We always had a lot of aged tobacco. And as we started aging more and more, we started doing better." Fuente's business truly began to soar during the cigar boom of the 1990s, built upon such cigars as the Arturo Fuente 8-5-8, the Hemingway series of perfectos and later the rich and robust Fuente Fuente OpusX. The business today stands as the largest family-owned producer of premium cigars. Fuente Sr. was predeceased by his wife, Anna Louisa Lopez Fuente, who died in December. They were married for 62 years. He is survived by his sons Carlos Fuente Jr. and Richard Fuente; daughter Cynthia Fuente-Suarez; brother Arturo Fuente Jr.; grandchildren Liana Fuente, Rosana Fuente, Christina Suarez, Lidiana Fuente, Bianca Suarez, Sofia Fuente and Carlos Fuente III; great-grandsons Alvaro Valerio Jr. and Arturo Valerio and great-granddaughter Anna Valentina Valerio. TABACALERA A. FUENTE Y CIA.